Have I really not changed anything here in four and a half years? No. But, for whatever reason, I have failed to keep this activity log updated. Here are a few things I have done recently. Here is the page describing the Plane Dancer prestige class for V3.5 D&D. This is an epic-level class intended for a character who has completed all 10 levels of the Fochlucan Lyrist prestige class from The Complete Adventurer. I have collected the various mechanisms for characters to create Demiplanes in V3.0, V3.5, and Pathfinder. The purpose of this was as input for my adaptation of the Planewalker 10 demiplane seed ability into a more modern planar sanctum ability for Plane Dancer 10. I have collected the Epic Feats from the Epic Level Handbook (published in the SRD) and began pricing them using the Feat Point System we use in the campaigns I play in. My character Brianna is currently adventuring in The Darkest Hour, an epic campaign. We expect one additional epic module after that, which will result in she and her companions achieving Divine Rank 0 and thereby becoming immortal "quasi-deities". I expect that Brianna will be CL 31 at that time, and she and her companions will retire as actual Player Characters. Just for fun, I have imagined The Divine Brianna's progression to CL 45/Divine Rank 1 (Demigod), CL 65/Divine Rank 6 (Lesser Goddess), and CL 80/Divine Rank 11 (Intermediate Goddess). I used the divine rules from Deities and Demigods (as updated to V3.5 in the SRD), as well as epic feats, feat points, and the "magic rating" variant rule from the SRD that our campigns use. 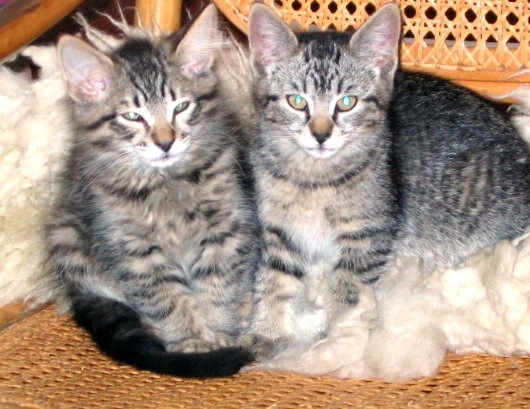 I uploaded a photograph of my two kittens, Pombi and Loki, as they were at 10 weeks. I finally published my page on Sheri Tepper's World of the True Game. I added a page showing Thalia Took's Goddess Oracle Deck. I added a page documenting how to display Runes using Unicode. I updated the character sheets for Mambo, Tigerblade, Vandis, and Zhaji. I programmed my Dargas Adventure Database to generate an HTML table. I installed the very lengthy result in a page of Dargas Adventures. I just switched my Web Hosting provider. I now have room for a hundred times as much file storage, as well as many additional website options. This change will allow me to install local DB-based message boards, and such. I migrated the whole site over and there shouldn't be any visible changes. But if there are, let me know! With his permission, I have installed a copy of Ryk E. Spoor's Wish Power List. As far as I can tell, this is currently the only accessible copy left on the Internet. It's AD&D, not V3, but it's well done and thought provoking. Ryk says: "I try to run Wishes as they were in legend and story, not as spells, even if they are spells." I added a Gallery of Minifigs to display the work of my talented fellow players. I added my treatise on Variant Rules for Metamagic. Actually, I did it a couple of days ago, but version 2 of the document is up now. On the City of the Spider Queen page, The Shattered Tower is now available. Veracity and I both write up raw notes for the Dargas campaign. Yoshi and Nessey both publish raw notes for the Tarrastra campaign. When I write up the "story" for either campaign, I pull from all available accounts. Since the raw notes are interesting, I now provide a link from each story page to a page containing the notes. On the City of the Spider Queen page, Attack on Kurgoth is now available. On the City of the Spider Queen page, Planning and Scouting is now available. I've continued adding raw adventure logs to the City of the Spider Queen page. But, now that the party has finally arrived in Maerimydra, I actually wrote up the Arrival at Maerimydra and Initial exploration in Maerimydra sessions as "stories". Whee! I launched the Tarrastra campaign this summer, and published the Player's Guide to the campaign, as well as references on available races, classes, feats, spells, and deities in the campaign. We've had ten sessions so far and the Player Characters have achieved ECL 3. I also have a page of information on the Adventures, including the NPCs of note and adventure logs for each session. Added links to my ezboard forums and to the top-level index of the Tarrastra campaign, although there is nothing much published there, yet. There's actually been a whole bunch of hidden activity on this website in recent months, as I prepare for opening my new campaign. It will all show up all at once, once I "open for business". But, in the sections that are already present, I added the Death Kiss Beholderkin, Purple Worm, and Tomb Tapper encounters to the City of the Spider Queen page. We reconstituted Veracity as an Eldritch Knight, Yol as a Mystic Theurge, and Tebryn as an Arcane Trickster. All of those characters have also been redone to use Feat Points, as have Brianna (who also advanced a level), Hazen, and Kress. Using Mark's data, I updated the table cross-referencing the adventure numbers, game session dates, and adventure names within our quest to the City of the Spider Queen. I added a discussion of Character Death and Energy Drain, inspired by Andy Collins's theory of The High Cost of Dying. I renamed the "dnd" directory: it is now the "rpg" directory, so that I can put stuff for all Role Playing Games into it, rather than just Dungeons & Dragons. I left "dnd" as a symbolic link, so old bookmarks should work just fine. I restructured the stories of the City of the Spider Queen adventure more logically: rather than having one gaming session per page, I put each encounter on a separate page and grouped them by day number of the adventure. I completely reorganized the directory structure underneath "dnd" and made several files the index.html for their respective directories. I didn't add any new content, but there is a chance I broke some links. Based on peer review, I simplified and clarified my treatise on Experience Point Awards. I analyzed the Experience Point Awards chart in the Dungeon Master's Guide and learned some interesting things. Along with other gems of insight, I found at least seven errors in the published chart. I added a link to the sidebar to get to a top-level Dungeons and Dragons page. Now I just need to figure out how to organize it. Added raw data for our session of 02/26/2004. Installed hot links on the "stats" pages of Brianna, Hazen, Marga, Tebryn, Tigerblade, Veracity, and Yol, for non-standard Feats, to the appropriate table in the Custom and Variant Rules in the Dargas Campaign page. The Unearthed Arcana Weapon Groups have been adopted in Dargas. I put up a page describing the Custom and Variant Rules in the Dargas Campaign: what makes it different than "by the book" V3.5 D&D. I included a write up about the Level Adjustment Reduction method from Unearthed Arcana, which we are considering adopting, if we can figure out how to retrofit it to our existing high-level characters. Added raw data for our session of 02/19/2004. Updated the statistics of Brianna to reflect her new cloak of charisma +4. It's about time. I converted some of the backlog of the raw data into polished episodes for our City of the Spider Queen adventure. So far: 11/13/2003. Added raw data for the 01/29/04 episode of the City of the Spider Queen. Updated the possessions of Veracity, Brianna, and Tebryn. Installed the raw data for the most recent seven episodes of the City of the Spider Queen. I'm taking writing-intensive World History classes, but as I am now between semesters, I'll do what I can to convert the raw data into stories. Added recently acquired magic items to stats pages for Veracity and Brianna. Added Black Star, Dirgon, Xeno, Henry, Catherine, Pietr, Agon, and Knack to the Player Character Birthday List. Added City of the Spider Queen episode for 11/06/2003. The gallery now has pictures of Alphonzo and Roethan. Added City of the Spider Queen episodes for 10/16/2003, 10/23/2003, and 10/30/2003. Created a page of information about Chondara. The gallery now has pictures of Jacques, Nute, Qlair, and Zeight. Additionally, Eris is now signed and Sherman has the correct holy symbol. I installed a place-holder for Alphonzo in the gallery. I put up a Player Character Birthday List. The gallery now has pictures of Chondara, Eris, and Sherman. Additionally, Hermon, Ivan, Malarky, and Squint have had minor touch-ups done to them. This site is now listed on the RPG Gateway under "Systems/Role_Playing_Games/Dungeons_and_Dragons/3rd_Edition" and "People/A-F". Go ahead and vote. Marga's picture is now in the Gallery. All of the character now have full sized pictures available: if you are on the "main" page for a character (as opposed to the "stats" page), when you click on the image, you'll get a page with the same text but with a full-resolution image, twice the height and width. If you click on the large image, you get back to the page with the small image. I scanned in the map of the Mansion in Sigil and inserted images of the floors into the tour guide. I converted the entire site to use navigation inspired by BlogMax. I didn't want a blog at the top level of the site, so I customized the package to suit my needs. With it, I have template files that apply the same look and feel to every page on the site. And, its tight integration into Emacs makes working with the site a breeze. For example, when I type C-x C-s to save a .txt file, it also generates the .html file. If I use C-x M-s, after generating the .html file, it uploads it to my web server. Finally, if I use M-x website-upload-directory, it walks the entire directory structure of my site, applying my templates to the .txt files to create .html files, and uploading them here.